Standard mesothelioma treatment options include surgery, radiation therapy, chemotherapy and multimodal therapy. These standard therapies do not offer a cure for people with mesothelioma, and that’s why scientists continue searching for better ways to treat the disease. Researchers at the Scripps Research Institute in Jupiter, Florida, have created a precision medicine approach that targets a protein on the surface of cancer cells to kill tumors. Although the drug was not specifically designed for mesothelioma patients, it may offer a more effective way to manage the disease in the future. The treatment is a type of immunotherapy that uses antibodies created in a lab. So far, the U.S. Food and Drug Administration has approved the drug for the treatment of a type of leukemia. Scripps researchers call the new immunotherapy “T-cell engaging bispecific antibodies,” or simply bispecific antibodies. Details of the novel drug were published May 29 in the Proceedings of the National Academy of Sciences. The new approach aims to bring powerful immune cells right to the tumor. This should prompt the patient’s immune system to attack and destroy the tumor. Bispecific antibodies are an immunotherapy treatment, but they are a supercharged version of existing immunotherapies. Existing versions use one antibody, while bispecific antibodies include two antibodies in one drug. Many cancers have the ability to flip a switch on immune cells which tells them to not attack the tumor. This allows the cancer to grow unchecked. Current immunotherapies latch onto and block the part of cancer cells that tell the immune system not to attack the tumor. 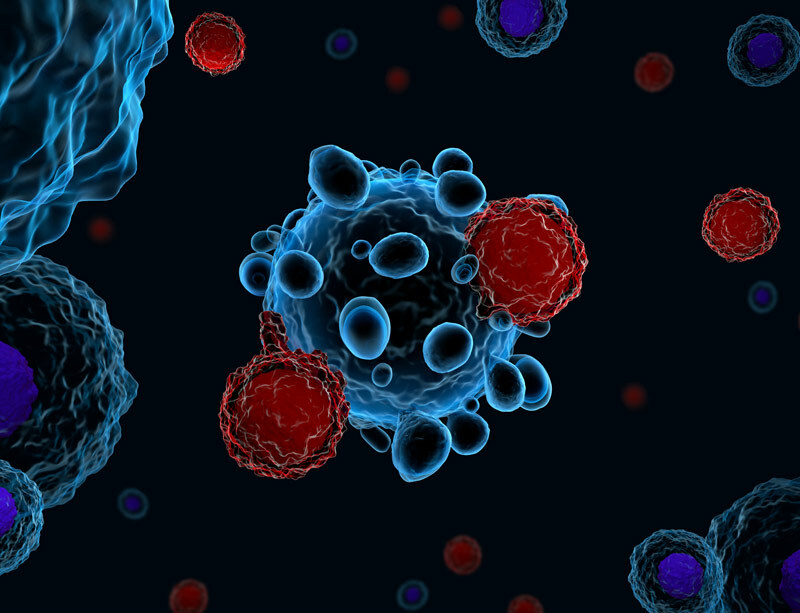 Immune cells can now recognize the cancer as something that needs to be destroyed. However, immune cells still need to find the tumor for the treatment to work. Cancer experts know this is an important step in how immunotherapies work. In fact, patients with tumors that have more immune cells called tumor-infiltrating lymphocytes (TILs) around them tend to respond best to immunotherapy. Tumors with fewer TILs often do not respond well to immunotherapy. First-generation immunotherapies use one antibody to block the cancer’s ability to stop immune cells from recognizing the tumor. After doctors administer these drugs, the body still needs to move immune cells to the tumor for the therapy to work properly. The new therapy goes one step further to make this happen. It has one antibody that latches onto and activates the body’s own killer T-cells, which are powerful components of the immune system. A second antibody holds onto a protein called ROR1, which is only found on the surface of some cancer cells, including mesothelioma. The two-antibody combination pulls the body’s T-cells toward the cancer. The T-cells are activated to release substances that destroy the tumor. Normal cells do not produce high levels of the ROR1 protein on their surface. That means unlike existing immunotherapies, the activated killer T-cells are less likely to target healthy tissue. Experts hope the therapy will have fewer side effects as a result. How May the New Drug Benefit Mesothelioma Patients? Although mesothelioma was not the focus of this preclinical research, the drug may benefit patients with the asbestos-related disease because of the way it works. The drug is designed to target the ROR1 protein found on certain cancers. The study’s authors tested the medication against breast cancers that exhibit the ROR1 protein, and it destroyed the cancer as intended. A study published May 29 in the journal Genes to Cells confirms ROR1 is present on mesothelioma cells, too. Mesothelioma patients who are no longer receiving any benefit from their current therapies should ask their doctor if they might qualify for a clinical trial or other potential new treatments. ClinicalTrials.gov lists dozens of clinical trials on other immunotherapies to treat the disease. In the future, the newer bispecific antibody approach may be studied in a mesothelioma clinical trial, too. Qi, J. et al. (2018, May 29). Potent and selective antitumor activity of a T cell-engaging bispecific antibody targeting a membrane-proximal epitope of ROR1. PNAS, 201719905, Published online ahead of print. .
Saji, T. et al. (2018, May 29). Critical role of the Ror-family of receptor tyrosine kinases in invasion and proliferation of malignant pleural mesothelioma cells. Genes Cells, Published online ahead of print. DOI: 10.1111/gtc.12599.